Yesterday was Jeremiah’s last day of preschool. I’m crying. I’m scared. I’m worried. I know so many of you can relate. The awesome thing is that Jeremiah’s preschool teacher can relate because she has an autistic son who’s sixteen. She has said over and over through our three years together that Jeremiah reminds her so much of her son. She knows what it’s like to move from one class to another, changing teachers, aids, and paraprofessionals. Sometimes they’ve been blessed with amazing teachers and staff, and other times it’s a whole different story. And, yes, you may have caught that above, Jeremiah’s been in this same preschool class for three years. That’s a LONG time. It’s like a second home.In fact, his teacher, Ms. Gina, got teary eyed during our last conference. What can I say, Jeremiah touches people’s hearts. Ms. Gina has been an exceptional teacher. At the end of last school year she recognized her classroom was becoming too comfortable for Jeremiah. This is great as a parent, and for the kid. Comfortable is good right? Well, Ms. Gina knew that Kindergarten was looming in Jeremiah’s future and wanted to prepare him for a small degree of the change he would face. She entirely rearranged her classroom before school started in fall of 2014. She moved everything for the first time since being the teacher there. For him. This is part of why I’m so concerned about next year. We’ve had an amazing teacher, aid, and paraprofessional, we’ve also had some great therapists in the last three years. But what about next year? Jeremiah won’t have the same teacher, aid, paraprofessional, and one of the therapists who’s been so successful with him won’t continue on to elementary either. Those who know him so well and care about him so much won’t greet him every day or be there to know why he’s upset, what he needs, what’s bothering him. The ONLY thing that gives me solace in looking to next year is that the principle is exceptional. It’s because of her dedication that Jeremiah’s school is inclusive, including special needs students in the general classroom. Mrs. Bianchi cares about each of her students as if they were her own, and I’m not just saying this as a cliché, she really cares. When the preschool class had to meet in the library instead of their classroom because of an issue, the principles concern was for Jeremiah. How would he do? Because of his autism, Jeremiah needs consistency and routine. Not being in the classroom, where he is every school-day, could be disastrous, and Mrs. Bianchi knows this and was concerned about him. My fears are lessened a little more because Mrs. Bianchi has an active presence in the school. She’s visible most of the time, not shut in her office. She sees Jeremiah almost every day as he’s made his way to the kindergarten (see info on “transitioning” below). Because of this exemplary school (a public school by the way), they’ve done so much to help transition Jeremiah into the Kindergarten class. First, it’s important to know who the child’s teacher will be the following year. 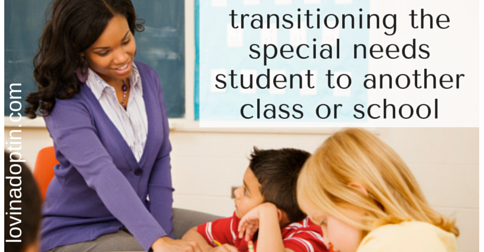 Even though most students haven’t been assigned to a teacher yet, the children with significant special needs have. This needs to be done before the following steps can be accomplished with a positive outcome. A few months ago, Jeremiah’s Speech Pathologist took a video on her iPad of the walk from the preschool (modular) to the Kindergarten classroom (main building). The therapists, teacher, and aid have taken turns walking him to “Big School,” while showing him the video as they walk. They began by first walking in the front door of the school, they did this every day for several days, then they would walk to the gym for several days. They went further and further until they were at the Kindergarten classroom. Sometimes kids were in the class, sometimes they were in the library, computer, etc. But Jeremiah went in each day, finally to the point that he sat with the kids in circle-time! Yeah, I know, pretty cool since he just started sitting on the floor during circle-time in preschool! This does a couple things. It gets the child used to going to a new place, new class, with a new teacher. It begins to prepare them for next year when they’ll be going somewhere new, it won’t be such a shock when they walk through those doors the following school year. Another great benefit is the teacher (and possibly aid or para) can get to know the child a little before starting the school year. It’s better than walking in to a new situation without knowing what to expect, that’s already the case with the other twenty students. Another extremely helpful step is a “transition planning meeting.” We just had this meeting last week, and I thought it quite valuable. Those in attendance are, preferably, the current teacher, principle, school psychologist, special needs teacher, any therapists who work with your child, future teacher, aid (if there will be one), paraprofessional, and of course the parents. If the child who has special needs can attend the meeting, I would highly encourage this, they’re input is essential, they are the best indicators of what works and what doesn’t. Why should parents attend? Because your input and involvement matter! I once heard an educator say, “When parents are involved, their kids are worked with more. I know it shouldn’t be this way, but it is.” Be involved, know what’s going on, communicate with your child’s educational team. You will see why it was important for my husband and I to be at the meeting when you see the questions that were asked. We were able to add our input on every topic about Jeremiah, our voices were heard and I’m positive much of it will be implemented (if the principle has anything to do with it). The Kindergarten teacher asked if she could get a copy – one was typed out and sent to each person in attendance. I took notes for you at the meeting (or in my head anyway). 😉 There were four sheets and each one had a title. Everyone shared their thoughts on each heading. Instead of being another child, another number, it’s important for those who know Jeremiah to share who they think he is. If you do this with your school, share your fears, it’s good to work it out together, and maybe the staff can help ease some of them. Teachers, encourage parents to share those fears and be open to hearing them, they are real and vivid for us. This is even more true when our children can’t communicate or can’t communicate well. We have no idea what’s going on behind those doors unless we’re present and that’s not possible all the time. Hopes are easy to share, everyone pitched in. Current teachers and therapists can talk about this from their perspective in the classroom. Parents can share what works at school and what doesn’t, they can also share what works at home and what doesn’t. It doesn’t seem that home and school would overlap, but they do all the time. Each point was assigned to a person at the table to work on. What needs to be prepared for next year? A trampoline installed? A swing? Who will take photos of the classroom for PECS or a communication device? Parents, I hope this helps you know you’re not alone, that this is scary for some of us, and what you can share with your school to help transitions to go smoother. If you’re a teacher, I hope this helps you know how to make transitions better for your students. I don’t share these positive stories to make special need parents feel bad. I know there are so many situations that fall far below what is desired by parents; schools don’t work with you, teachers don’t treat your child right, you wish you could keep your child at home. I share our stories because I want to educate teachers on how it can be done and how it can work. 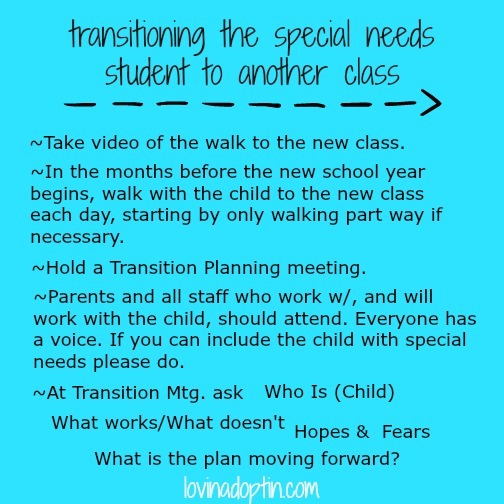 Be sure to share this with teachers you know so we can make life better for special needs kids. You can receive each post made to Lovin’ Adoptin’ by subscribing in the upper right corner. If you’re on a mobile device, this may need to be done on the web version. You can “like” my Facebook page and follow me on Twitter and Pinterest for more helpful information and links.